The 2014 Junior Boys Football team has had a very successful season this year, being crowned Champions of both the League and the Tournament. In the League, we were undefeated in all of our matches. In the opening game, we beat BSB 3-0, moving on to beat MKS, the French School, IKNS and Riffa Views. Our final game of the season was against Bayan School, our only away match of the season. Despite the change of surface, the game finished 7-1, leaving us as Champions. 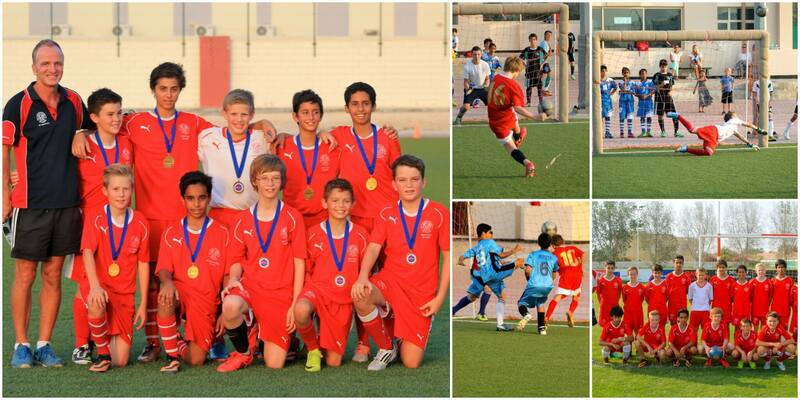 Faisal Al Khalifa and Aidan Shretta both played very well and were our team’s top scorers. The Tournament was a week after the season finished, also held at Bayan School. We started off slowly, drawing at Riffa Views, but won our next two games and topped our group. We faced BSB in the Semi-Finals and, despite an amazing free kick from Ahmed, the match ended in a 1-1 draw. Penalties from Adam, Callum and Jordan, along with a great save from George in goal, secured victory and a place in the Final. In the Final, we played MKS, and with two goals from Aidan Shretta, we won the Tournament. A big thanks to Coach, Mr Subbiani for a great season.